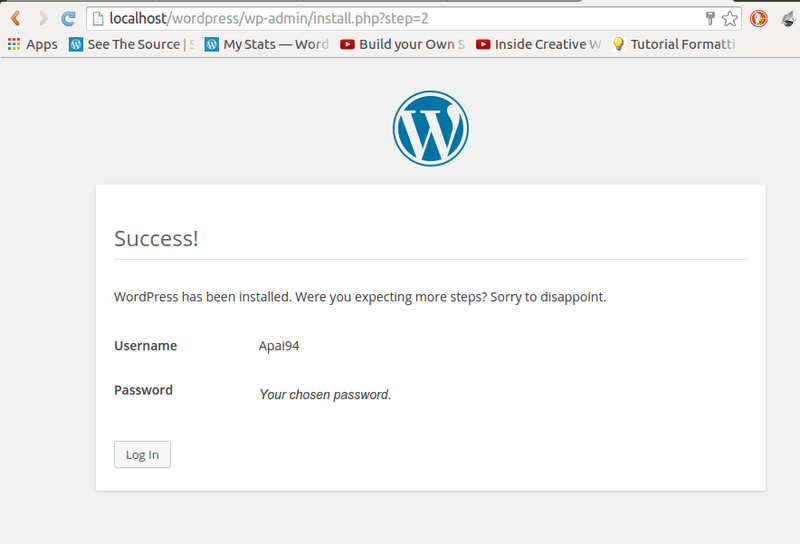 6 Upload the Files and Running wordpress install script. 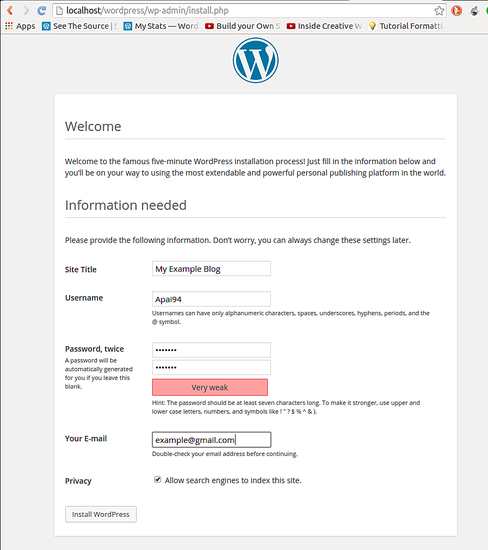 Wordpress is a free open source blogging tool and CMS used by millions of people in the world. Its simplicity, power and flexibility places it as a top choice for people to use and developers to recommend. It has come a long way from its release in May, 2013. It consists of tons of themes, plugins and features that help the user to obtain speed, security and reliability. The pre-requirements include latest versions of PHP, MySQL and apache server. On a Linux system this would mean installing a LAMP stack or on Windows, it would be installing the WAMP stack. now use the following command to set password, but make sure you change "your_password" to what you want. WAMP can be downloaded directly from this link here .Once downloaded, run the file. 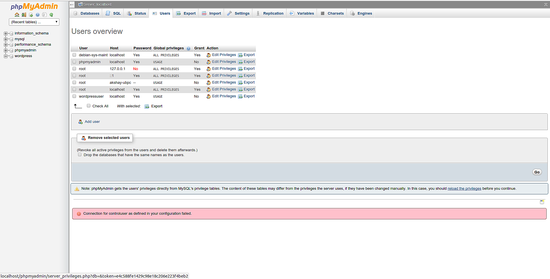 You will be able to see the configuration/version of each component of WAMP as shown below. Click on next and then finish it. When prompted, allow access for the hhtp server through the firewall. 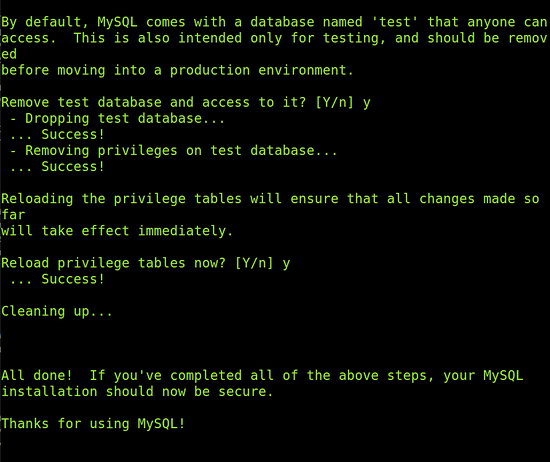 And this starts the WAMP server. To test if it is working, type the URL in a browser: http://localhost/ . If a screen appears as shown below, then it has installed correctly. 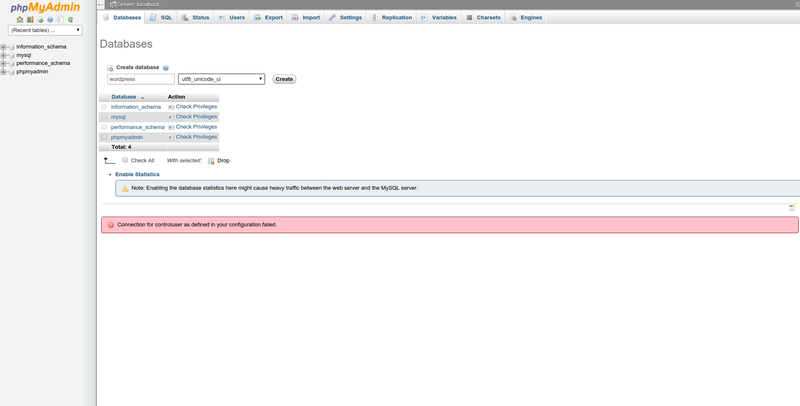 The WordPress package once downloaded has to be extracted and placed in the wamp serverâ€™s root directory. 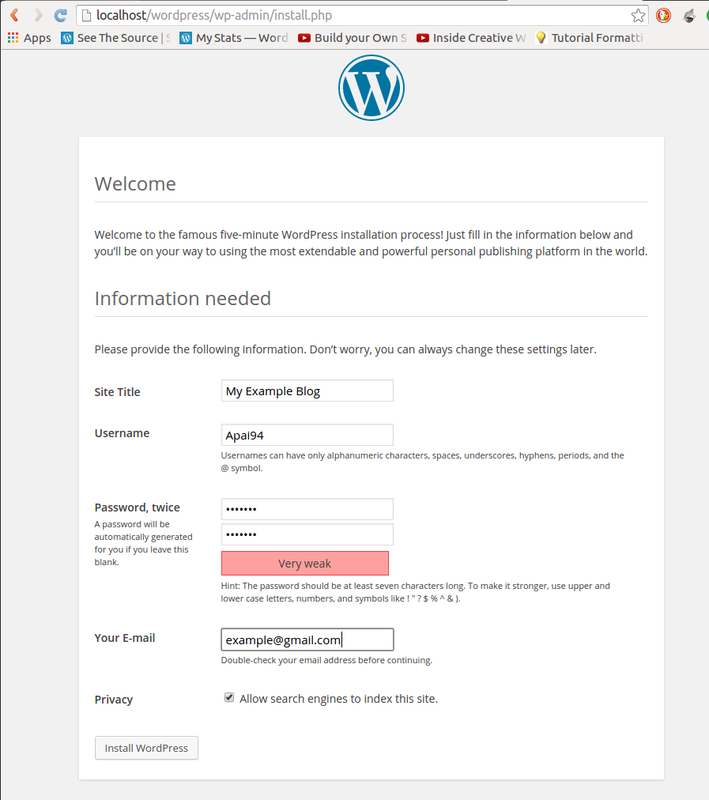 So place the WordPress extracted folder at location: "c://wamp/www/". 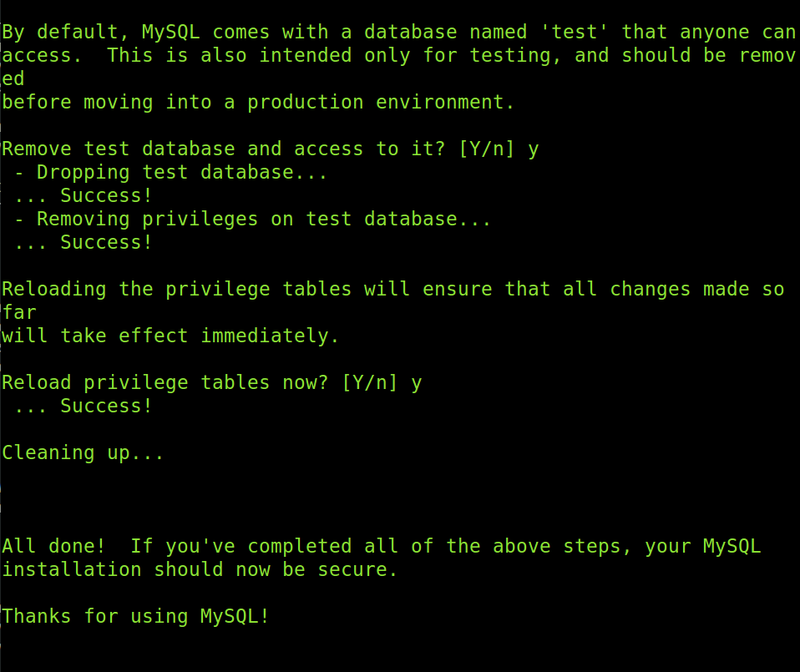 In a browser, use the URL: "http://localhost/phpmyadmin" to get the phpmyadmin page. 1) on the phpmyadmin page, click on the "database" tab at the top bar. 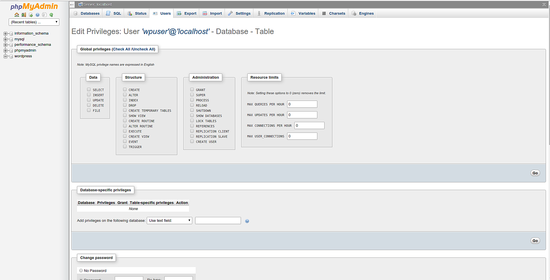 Then in the textbox below, enter a name for your database. 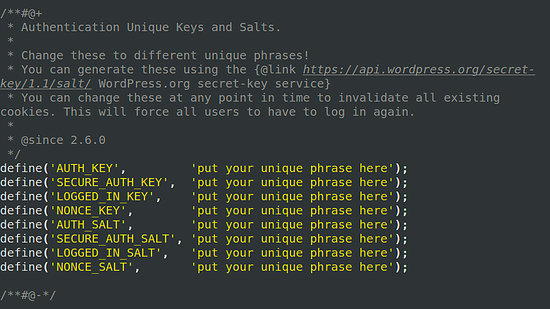 Here I name it "wordpress" and choose the collation as "utf8_unicode_ci". Then click on the "create" button. Once the create button is clicked, the wordpress database should appear in the left panel. Refer to the image below. 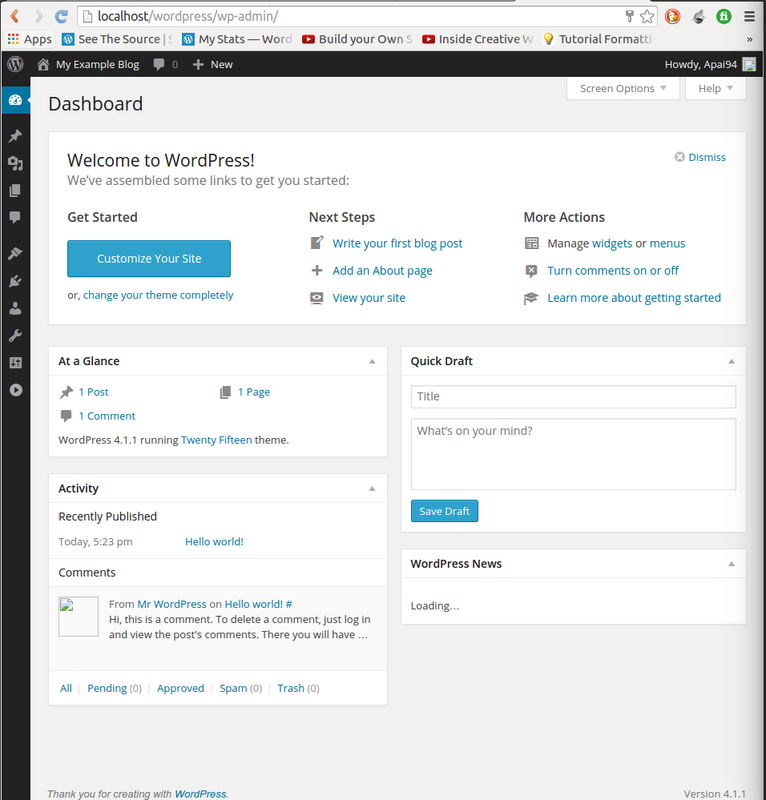 2) Now we create a user for wordpress. To do so, click on the home icon at the top of the left panel. Then click on the "users" tab at the top of the screen as shown in the image below. Click on the button below that says "Add User". Provide a username. I have chosen "wpuser"
Enter a password and re enter it. selct host as "local"from the dropdown menu. make a note of password and username. leave the other fields as it is and click on "Go" button at the bottom of that page. Once these steps are completed, you will be taken to the users page. 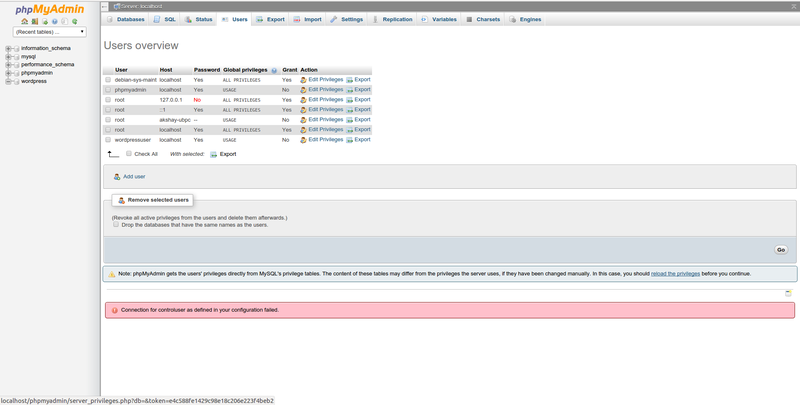 Now in this page, click on â€œedit privilegesâ€ for the user that you have just created. 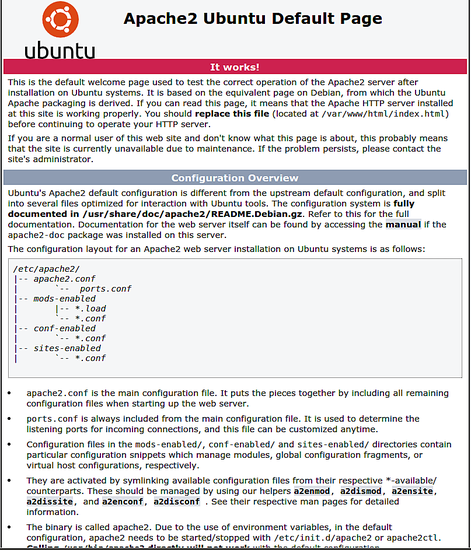 'wpuser' in this case and a page appears as shown below. 3) Now do the following steps. 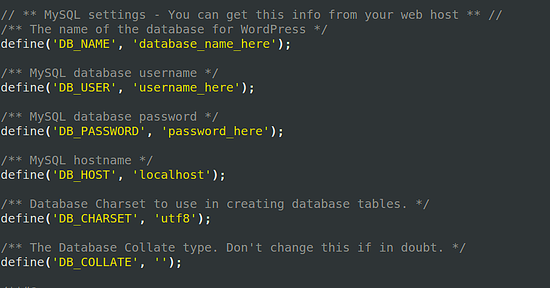 Under the database specific section, select the "wordpress" database from the drop down menu. You will get checkboxes under 3 sections of Data, Structure and Administration. Above that select the "Check All" option and the page will look like the image below. Click on the "Go" button for that section. 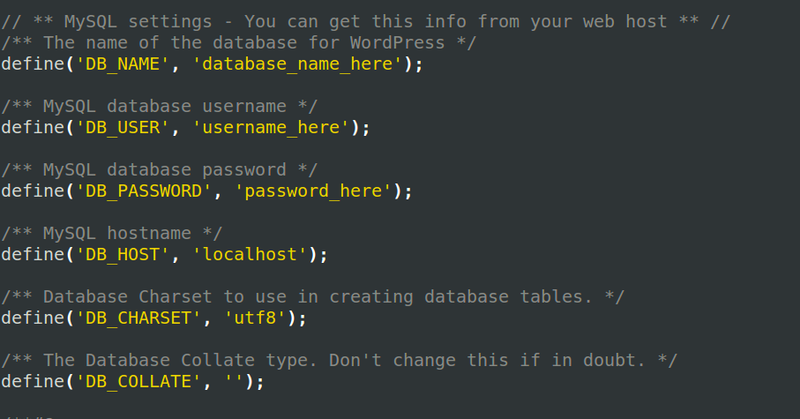 This file has to be configured to indicate the various database parameters required by wordpress to run config.php, and open it in a text editor. 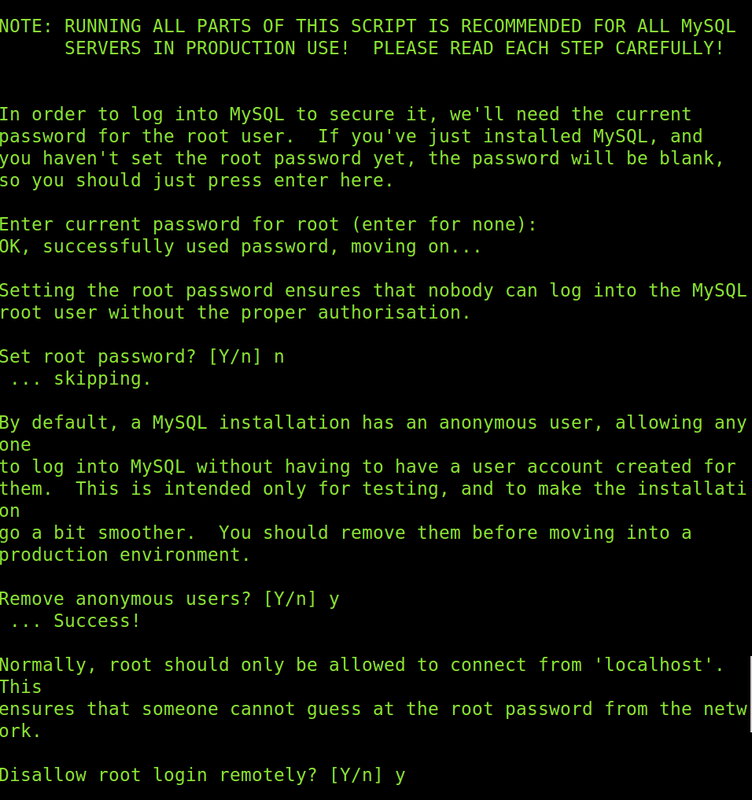 On Linux, the following command can be used. Each time you visit this link you will get a different set of values. The image below shows the value that I have got, and I will be using that. 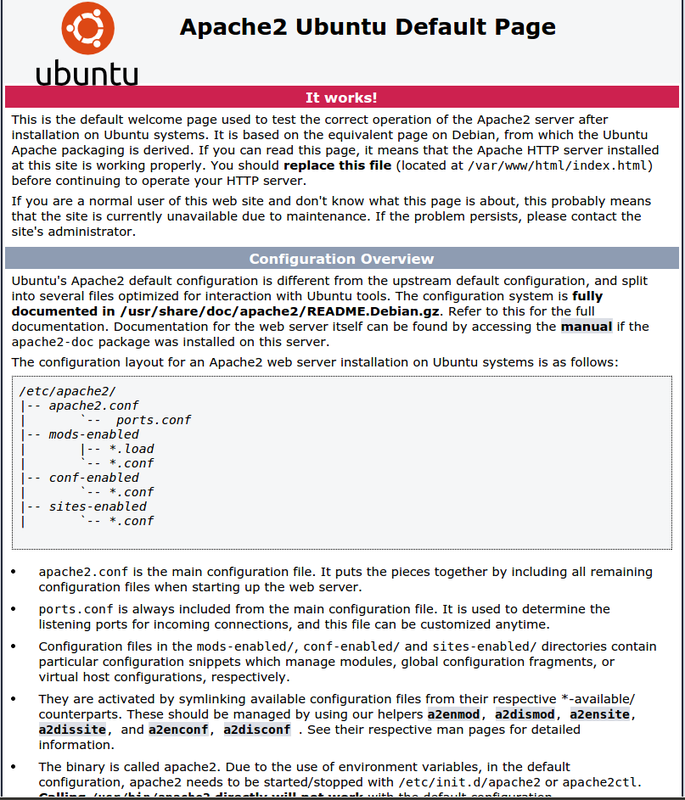 Below are the images showing the file before and after entering these phrases. 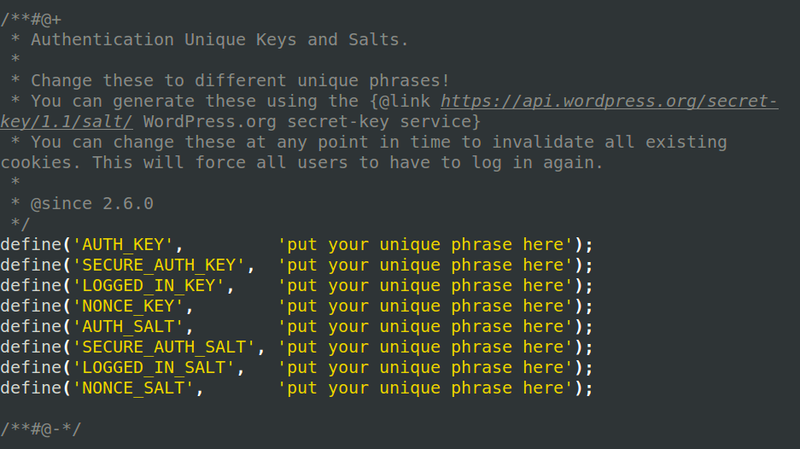 This recursively copies the wordpress to the server's root directory. Once the installation is successful, you will get a screen like the image shown below. You can then click on the login button, enter your credentials and you would have completed the installation. it's only localhost if you are installing on a local server. Otherwise, great tut. Till, you are the man. Thank You for sharing this awesome article, for a long time I was using shared hosting and this article helped me when there's any problem while installing WordPress.